Cavities are a problem that affect millions of children in the US and around the world. The problem is so widespread that it impacts more than a quarter of children aged 2 to 5, and this number rises to in excess of 40% for children between the ages of 2 and 11, who will develop at least one cavity during their childhood. 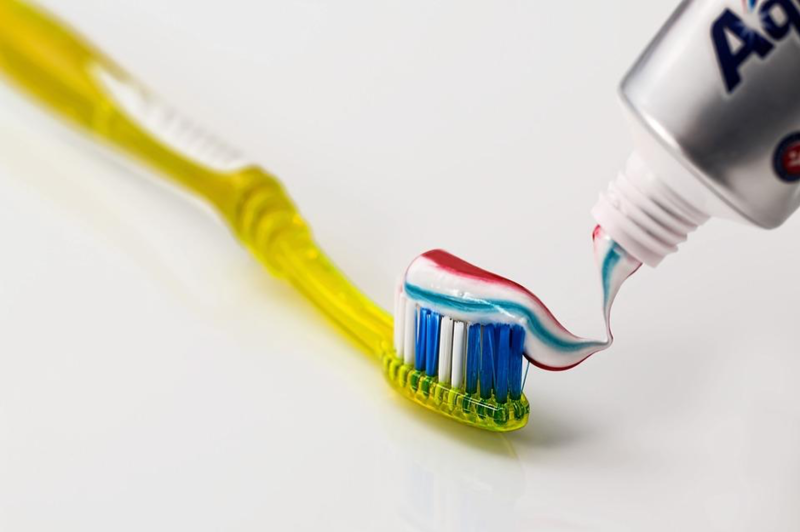 While very common, cavities can be prevented, and brushing plays a big but not absolute part in this. Periodontitis, also commonly referred to as gum disease, is one of the most common diseases in the world; it’s estimated to affect almost half of all Americans. Whilst common, the condition can be very serious, as the structures that support teeth become inflamed; this can cause teeth to fall out and the jaw to be severely damaged. Periodontal disease can be reversed in its very early form, a condition known as gingivitis, but once the gum disease has advanced, the only option available is to treat the disease and manage the symptoms. Treatments available include both surgical and non-surgical options. 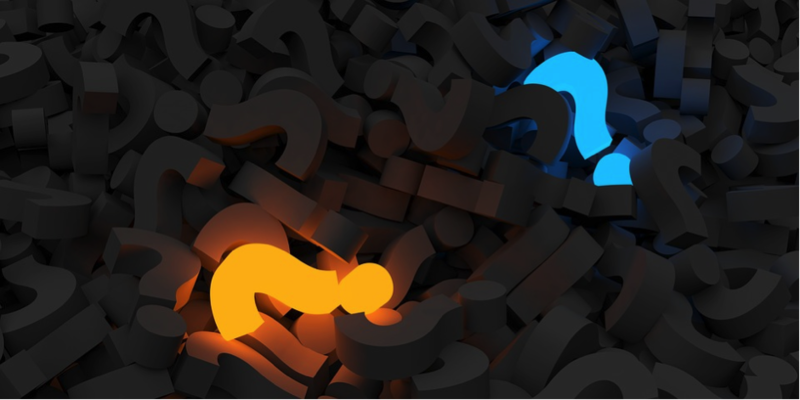 It’s often the case that non-surgical options for managing the condition will be explored first, as they’re normally more affordable and significantly less invasive. While non-surgical treatments are not always possible, or the most effective option, they can be incredibly beneficial in many cases. Non-surgical treatments are often where dentists choose to begin when suggesting initial treatment for periodontitis. The main purpose of non-surgical periodontal therapy is to get rid of bacteria and toxins from teeth in order to better control the infection. Depending on the type of periodontal disease that a patient has, the exact treatment course will vary. Sometimes minor treatments can be suggested to address the early signs of periodontal disease, whilst in other situations, more extensive non-surgical treatments will be required. Tooth loss can be the cause of an injury sustained to the mouth or it can be the result of a disease or tooth decay. No matter the reason behind the tooth loss, receiving treatment for the lost tooth from a family dentistry is of the upmost importance, both for your oral health and for the confidence that you have in your smile. Two treatments that are often suggested in the event of a lost tooth are dental implants and dentures. Both of these treatments are able to restore the natural look of your smile but in very different ways, that certainly aren’t interchangeable. Dental implants are not what many people think they are; they’re not a replacement for a missing tooth, but a replacement root that will be able to hold a replacement tooth in place. A dental implant is a very modern way of overcoming the problem of lost, broken, or damaged teeth where the tooth needs a complete replacement. A dental implant is often made from strong titanium steel that is capable of properly supporting a replacement tooth. The replacement tooth will then commonly either take the form of a crown or a bridge, which offers the option of being permanent or removable. The aim of a dental implant is to make the replacement tooth look as natural as possible and have the function and feel of a natural tooth. Often people find that with a dental implant, their ability to chew food and the sensation of chewing is very close or undisguisable from a natural tooth. What Does Dental Implant Treatment Involve? Dental implant treatment involves surgically fusing the titanium steel post to the jawbone. This procedure is performed by a specialist in general or family dentistry and is undertaken whilst the patient is under a local anesthesia. Once the post has been implanted, the area is left to heal for up 3 months, during which time the bone will heal around the post. As soon as the area has properly healed, a specially made replacement tooth can be attached to the implant to achieve a natural look. 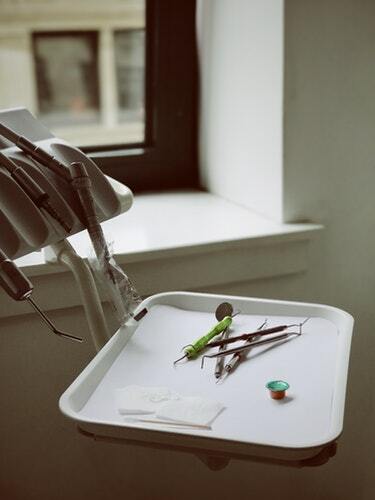 Having a dental implant has many benefits, like the implant not impacting the surrounding teeth and the ability to speak and eat like normal after the procedure. However, dental implants are not a treatment that is recommended for everyone. For a dental implant to be recommended, a dentist has to be certain that the bone where the post will be implanted is healthy. The bone will need to be strong enough to be able to support and hold in place the replacement tooth. Dental implants are also more likely to be recommended in cases where just one or two teeth require replacement, but in some situations, it’s possible to have more than a couple of teeth replaced via dental implants. Dentures are very different to dental implants in look, feel, and function, as well as in the procedure involved in creating them. A denture is a solution to one or more missing teeth and takes the form of a full or partial removable base that is designed to fit over the gums or be clipped into place. This base or framework will contain one or more replacement teeth. The two types of denture, partial and full, are slightly different. 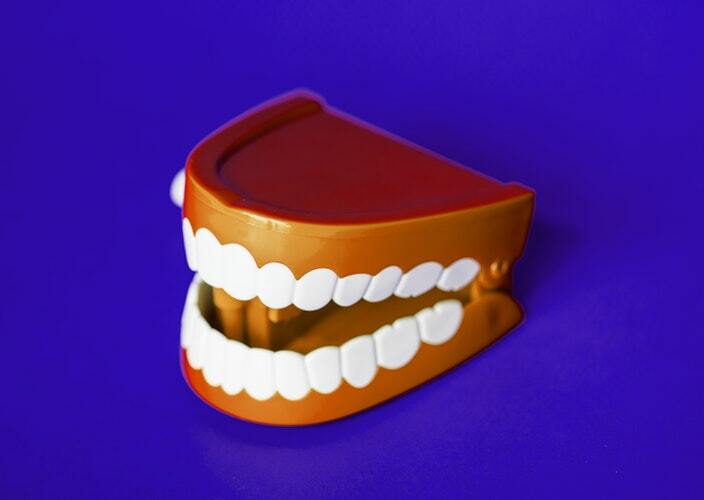 A full denture can be a complete horseshoe shaped replica of the bottom teeth, or a replica of the top teeth that is held in place with a cover for the top of the mouth. A partial denture uses a metal framework, and to keep the replacement teeth in place, clips are often used. The process for creating dentures can change depending on the patient, but commonly it’ll involve taking impressions of your mouth, before bite molds are created that will enable your dentist to check whether your dentures will be comfortable. The denture will then be created to match the color and shape of your teeth as closely as possible. A denture is fitted once damaged teeth have been removed or after you’ve had dental treatment after losing or fracturing a tooth. Dentures can normally be fitted straight away after treatment, but they will likely need replacing once the area has properly healed, so many people choose to wait to have them fitted. Dentures are commonly recommended when a large number of teeth require replacement. They’re also a much better option for patients that have weak or unhealthy bones and gums, as the process involved for dental implants is much more strenuous and requires significant support from the jaw bones. Dental implants and dentures are two very common solutions to the same problem of lost or damaged teeth, both with the aim of restoring your smile and the function of your teeth in the most effective and natural way possible. If you’re worried about lost or damaged teeth, then visiting your local family dentistry practice is the first step that should be taken to restore your smile. Dental problems can cause some of the most uncomfortable and debilitating pains in your teeth and jaw. If you’ve ever had a toothache, we’re sure you’ll agree with us! Oral pains can be distracting or at their worst debilitating, and it can be tempting to immediately contact a dentist to put your mind at ease. However, not all cases of oral pains are a dental emergency. It’s important to know which ones are emergencies and which ones can wait. We’ve compiled a list of the major problems for which you should see a dentist straight away, as well as minor ones that can wait. You should still visit a dentist if you suffer with any oral pain, but these are minor issues that do not require immediate medical attention. Along with our guide to what is and isn’t a dental emergency, we’ve included some tips on how best to look after your dental health, and keep your teeth looking and feeling their best. Some oral pains are signs of serious problems that should be addressed by a professional as soon as possible. You shouldn’t ignore any toothache, but some pose a bigger threat than others. A toothache with a deep and ceaseless pain can be an indicator of severe tooth decay. If the pain is continuous and throbbing, even when no pressure is applied to the tooth, you should see a dentist right away. If the pain continues for more than 1 day, contact an emergency dentist so they can help. If your toothache is paired with fever, earache or any other symptoms, you should also see a dentist right away. After a physical examination, the dentist may fill in the cavity which is causing pain, or when necessary extract the tooth entirely. Sometimes it is necessary to perform a root canal to remove infection from the nerve of the tooth. These days, with the help of advanced anesthetics, such procedures are painless and you will likely be given antibiotics to help the healing process. An oral abscess is another cause for calling the dentist straight away. An abscess occurs when an infection forms a pocket of liquid around the root of the tooth, causing severe pain in the jaw and gum. An oral abscess cannot be left untreated, as this can lead to the infection spreading to other teeth or into the jaw and neck bone. If your gum is swollen and red, you are experiencing pain in your tooth, gum or jaw, or you’re having trouble breathing and swallowing, you may be suffering with an oral abscess. Visit a dentist immediately to get it sorted. If a tooth is severely cracked or fractured, you are at risk of developing an infection and may find it painful to chew or swallow. It can happen as a result of a tooth cavity, a fall or other accident. If the crack is large and causing you pain, see a dentist immediately. If your tooth has been knocked out, you need to act quickly. Get to the dentist as soon as possible – ideally within 30 minutes of the incident – as every minute can make a difference between saving and losing your tooth. To maximize the dentist’s chances of saving your tooth, put it in a container with some milk, or reinsert it into the mouth and hold it in there until your dentist is able to see you. These oral problems might be disconcerting or painful, but they are not dental emergencies. Book an appointment to see your dentist to get these sorted, but no need to rush straight there. Toothaches are never a pleasant business, but there are many causes for toothache, not all of which require urgent medical attention. Unless the toothache is causing you serious, ongoing pain or you’re showing other symptoms of being unwell (such as a fever or jaw pain), you do not need to rush straight to the dentist’s, although you should still them for a checkup so the problem doesn’t grow into something worse. A chipped tooth can happen for a variety of reasons. Whether from a sporting accident or from eating something crunchy, it is a common dental issue and it does not usually call for an emergency trip to the dentist. The enamel that coats your teeth provides a strong protective layer, but if enough force is placed upon it, pieces can break off. The likelihood of this happening increases as you age and your tooth enamel wears down. Wash your mouth out with salt water to prevent infection and eat soft foods so as not to damage the tooth any further. Your dentist will be able to repair, fill or smooth off the chipped tooth to prevent any future problems from developing. Unless you are in serious pain, this is not considered a dental emergency. Bleeding gums are among the most common issues affecting oral health. Whether accompanied by pain or not, bleeding gums can be a sign of the early stages of gum disease. Bleeding gums are often caused by the buildup of plaque, and can be treated by improving your dental hygiene. Visit a dentist for more advice on this matter, but bleeding gums are not cause of immediate action. Most oral pain and dental emergencies can be prevented by practising good dental hygiene and keeping your teeth healthy.